Merry Christmas and best wishes for 2015 - hope that it will bring all that you wish for. Good health for all. Thanks Cuties for my Happy Birthday messages ! We had no Internet so could not answer - but I do thank all of you. A group hug - Cheryl in Johannesburg, South Africa. New free alphabet weekly from Hatched in Africa - just started. Some very nice free designs ! Ageless Embroidery has a new Christmas font starting - the matching numbers are in a $1.00 set in specials. Not free but a good price. Lovely free tooth fairy and a couple of others also. Four lovely cameo framed Christmas designs - each in 5 different sizes. Really beautiful. Thanks to Embroidery Library :-) They are only there until the 26th October so download them now ! A new site with quite a few nice freebies. On the main page are some really lovely doll faces - not for free but more of a choice than I have ever seen !! Freebies in most sets ! 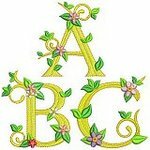 Ageless embroidery has an 80% off sale at the moment - found that out by chance. Prices are good. Just for interest worldwide - we all eat ! A free download/conversion software from Bernina. It is not a full designing programme but does convert between formats. Download the software and the e book separately.